In my last post I discussed the important role that gut bacteria play in our overall health and well being. In this post, I’ll detail the process of making your own sauerkraut at home so that you can increase the proportion of beneficial bacteria in your diet. “… there’s no better way to consume a bevy of bifidobacteria and lactobacilli than to get them from wholly natural sources, which make them exceptionally bioavailable (easily accepted by the body). These are the strains that go to work in your body in numerous ways. They help to maintain the integrity of the gut lining; balance the body’s pH; serve as natural antibiotics, antivirals, and even antifungals; regulate immunity; and control inflammation (…) they increase the availability of vitamins A, C, and K, as well as vitamins from the B-complex group” (Brain Maker, p. 181). “Not only does this fermented cabbage fuel healthy gut bacteria, but it also contains choline, a chemical needed for the proper transmission of nerve impulses from the brain through the central nervous system” (p. 183). My one-year-old, two-and-a-half-year-old, and I each eat a small serving of sauerkraut with breakfast every morning (yes, my young children eat it and even ask for seconds!). We eat it with breakfast because that is our largest meal of the day, and according to this blog, sauerkraut has the additional benefit of aiding in digestion. To make your own sauerkraut at home, you’ll need a quart or half-gallon sized mason jar (depending on how much you wish to make at a time); or, if you plan to get in the habit of fermenting foods on a regular basis, you can purchase one of these fermentation crocks (I use the half-gallon fermented vegetable master). Using a crock makes the process more fool proof, with less vigilance required during the 7-14 day fermentation period. You’ll also need a large, dense head of cabbage or several small heads; if the cabbage is very light, it isn’t dense and you’ll need more heads in order to get the same amount of sauerkraut. Then scrounge up 1.5-2 tablespoons of sea salt, a knife, and a large mixing bowl and you have everything you need! Before you begin, it’s important to wash your hands thoroughly with non-antibacterial soap and water so as not to introduce any harmful bacteria to the batch, and so as not to kill the beneficial lactobacillus bacteria residing on the cabbage with antibacterial soap residue. Once your hands are squeaky clean, remove the outer layer of leaves from the cabbage and discard. Then remove and set aside one of the second layer of leaves for later. Cut the remaining cabbage into thin shreds (do this by hand–a food processor makes the shreds too thin) and place in a mixing bowl. Sprinkle the salt on top (less for smaller amounts of cabbage and more for larger amounts–I use 2 tablespoons for a full mixing bowl of shredded cabbage) and toss the cabbage to distribute the salt. Using your hands or a pounder, squeeze/crush the cabbage until it is limp and cabbage juices have begun accumulating in the bottom of the bowl. Next, transfer the cabbage to your mason jar or fermentation crock one handful at a time, using a small pounder/pestle or your fist to pack down each handful (packing it down well is important). When all of the cabbage is transferred to the jar and pounded down, use the cabbage leaf you set aside earlier to cover the cabbage shreds, tucking the leaf around the shreds. 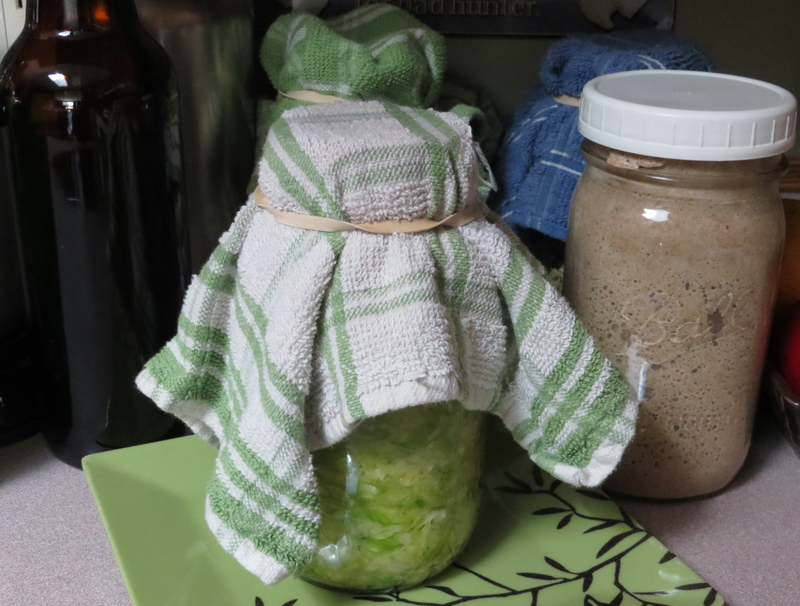 If you don’t have fermentation weights, set a smaller glass jar filled with water inside the mouth of the larger glass jar to weigh down the cabbage leaf. Once the leaf and weight are securely in place, pour the juices from the cabbage shreds into the jar and add a little bit of filtered water if necessary to make sure there is an inch of liquid above the cabbage (if you need to add more than a quarter cup of water, add some salt to the water in the ratio of one teaspoon per cup). If you’re using a mason jar instead of a fermentation crock, cover the jar with a cloth and rubber band and set it on a plate away from direct sunlight for 7-14 days (the longer it sits out, the more beneficial bacteria there will be). During the fermentation period, check the container at least once a day to make sure mold isn’t forming, which can happen if pieces of sauerkraut float to the top. If there’s a tiny bit of mold on a piece or two of cabbage, simply remove the pieces with a clean utensil. These “floaters” are easier to control if you use a small-mouthed jar (as opposed to a wide-mouthed jar) and fill the cabbage to just below where the top of the jar starts to curve in. This helps the cabbage leaf cover to stay in place. I’ve also boiled stones from my yard and used them as extra weights to keep the cabbage packed down around the edges. Mold won’t form as easily if you use the screw-on lid that comes with your mason jar, but you will need to release carbon dioxide every day or so by unscrewing and re-screwing the lid; otherwise, when you remove the lid after 7-14 days, all of the juices will surge out of your jar along with much of the sauerkraut in the same way a shaken-up bottle of pop will explode when you open it. Sauerkraut will last in the refrigerator for several months–although in our household, it never makes it that long before being eaten! The lactic acid produced by the bacteria as they consume the sugars in the cabbage keep harmful bacteria at bay, which is why many culture in northern climates preserve their vegetables via fermentation for the winter months. Once you get good at this process, you can apply it to other vegetables as well to create a medley of homemade probiotics that will be much cheaper and more effective than their manufactured counterparts!